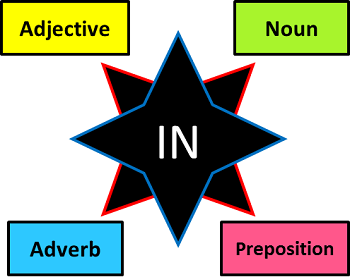 In the English language, the word “in” has multiple functions. It can serve as a noun, a preposition, an adverb, and an adjective. Sophie has an in with the president because she is married to the president’s son. In this sentence, the word serves as a noun which means influence. When you’re trying to get started in the industry, it helps to have an in. They must have an in with the manager. The Beatles were very popular in the 1960s. The word “in” is used as a preposition that indicates the period of time. The cupcakes are in the container. He got wounded in the leg. The text was written in pencil. The disease affects three in 100,000 children. The word “in” modifies the verb”walked,” and is therefore categorized as an adverb. He flew in on the first plane. Mix in the flour and eggs. It’s what the in crowd is wearing this season.